Every Sunday, my parents used to follow a ritual. Hearing them say “on va au café” one hour or so after lunch only made sense for a few families in our small rural village. Indeed, it was not said in the usual meaning of the words. They actually did not intent to go to the café in the village but instead and no matter the season — although in summer it tended to happen less often — they would walk to a friends’ house for a social afternoon drinking coffee, eating dessert and chatting about the latest news. Each week someone else would host and clearly, the highlight for my brother B. and I was to anticipate what desserts would be made. This was all we cared about. When we were the hosts, my mum often asked me to prepare the desserts, adding casually “Tu les fais de toute façon mieux que moi ! ” (You do them better than I do anyway). I suspect that she was just being sweet, hence allowing me to use some of her space in the kitchen. And I am so thankful: this is how I learned to bake back then. Because I preferred them by far, I typically prepared sweet fruit tarts, varying in flavor according to the fruit in season. Whenever possible, we would use fruit freshly picked in our garden, between apples, quetsches, mirabelles, cherries, reine-claudes (greengage), berries of all sorts and rhubarb. You might find strange to believe this but between my mum and her two friends Monique and Jeanne, even with my eyes blind-folded, I would have been able to guess what tart belonged to who. Each of them had a specific taste, a je-ne-sais-quoi that was clearly speaking of each woman’s method to bake. Jeanne’s tarte à la rhubarbe and tarte aux quetsches were some of my favorites. Her touch with them was special. I was particularly fascinated by her dough and the perfectly balanced sweetness of the fruit that allowed for the acidic flavor of each fruit to dominate, without the need of eggs or cream. Every time it was Jeanne’s turn to host le café du dimanche, I was secretly hoping that she would bake a tarte à la rhubarbe. I remember my impression the first time I had to buy rhubarb. Especially after I noticed its unwelcoming price. “Excuse me, but this must be a mistake, non?” I told the tall man I was used to see busy arranging the vegetable and fruit display in my local store. “It cannot be that expensive!” Didn’t people know that it could almost grow like a bad seed? Une mauvaise herbe ! Every spring, we used to have so much rhubarb that it was hard to keep up with it and know how to prepare it. We must have tried everything. And, when we grew tired of making rhubarb tarts, we would spend afternoons preparing preserves: compotes (stewed fruit), jams and syrup. Of course, with this time gone by now, rhubarb has become a special treat for me, because even finding it can become a challenge. “No, we have a hard time getting it,” my vegetable man told me when I asked him if they had any on a recent visit to the store. Contrary to common belief, rhubarb is actually a vegetable and not a fruit. Rich in vitamin C, this perennial plant is also full of dietary fiber. 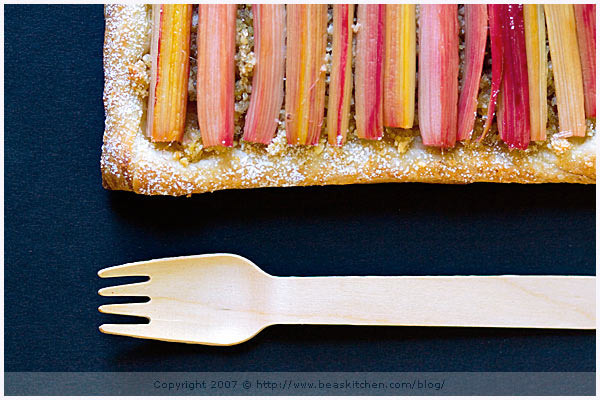 Like many I am sure, I have learned to eat rhubarb diced in tarts, with an egg/crème fraîche/sugar mixture. But many recipes vary according to regions and countries. In Alsace for example, it is typical to find rhubarb tarts with meringue on top, prepared similarly to a lemon meringue tart. My preferred recipe, however, is when I am able to skip these two and instead, keep this acidic vegetable almost intact so that it shines like a jewel, showing its beautifully complex array of colors and taste. I started by cutting the vegetable in long sticks and sprinkled it with sugar so that it could loose some of its water — this step helps with the cooking process of the fruit. Then, instead of the commonly used eggs/cream/sugar mixture, I chose to top puff pastry with almond flour mixed with brown sugar flavored with vanilla seeds and freshly grated ginger. And the result? Maybe not Jeanne’s tarte à la rhubarbe, but a revisited zesty and gingery rhubarb tart that left me truly satisfied and happy. But then, this was quite predictable as I am a known sucker for rhubarb under most forms. And if you are like me, you will hurry to go mad with rhubarb as long as it is in season. I am not looking forward to waiting until next year when it becomes available again! Peel the rhubarb and cut it in 2.5 ” long sticks. Place them in a colander placed over a bowl and sprinkle with 1/2 cup fine sugar. Let rest for 1 hour so that the rhubarb looses its water. In the meantime, roll your puff pastry thinly and divide in four 8 x 4″ rectangulars, and place them on a baking sheet. Preheat your oven at 420 F.
Make small holes with a fork leaving a 1/2 inch border. Cover with a plastic film and place in the fridge. Mix together the almond powder with 4 Tbsp raw brown sugar, the vanilla seeds and the ginger. Crumble. Take the dough out of the fridge and top with the almond crumble, leaving the border intact. 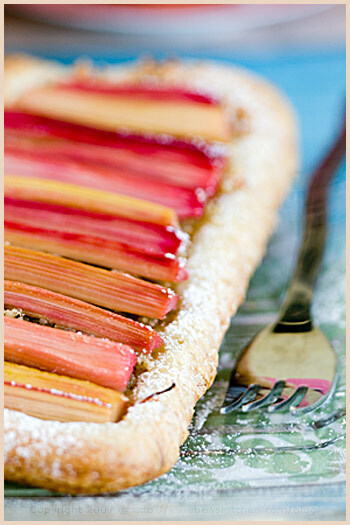 Arrange the rhubarb sticks on top and sprinkle with additional 1/2 Tbsp on each tartlet. Cook for about 20 min. Remove and sprinkle with confectioner’s sugar if desired. Pelez la rhubarbe et coupez-la en bâtonnets mesurant environ 6,5 cm. Placez-les dans une passoire placée au-dessus d’un saladier et saupoudrez-la de 50 g de sucre de canne. Laissez reposer pendant 1 heure pour qu’elle perde son eau. En attendant, étalez votre pâte finement et façonnez 4 rectangulaires mesurant 20x 10 cm. Mettez-les sur une plaque de cuisson. Préchauffez votre four à 210 C.
Piquez la pâte avec une fourchette en laissant une bordure de 1 cm Couvrez-la avec du film alimentaire et mettez-la au frigo, pendant 30 min au moins. Dans un bol, mélangez la poudre d’amandes avec 4 càs de cassonade, les graines de vanille et le gingembre râpé. Émiettez du bout des doigts. Sortez la pâte du frigo et étalez cette préparation sur les tartelettes, en gardant la bordure intacte. Disposez les bâtonnets de rhubarbe dessus et saupoudrez avec 1/2 càs de sucre de plus sur chacune. Enfournez pour 20 min. Sortez du four et saupoudrez ensuite de sucre glace au moment de la dégustation, si vous le souhaitez. Gorgeous tarts. If you love rhubarb, you’ll love the recipe up at Beyond Salmon (http://beyondsalmon.blogspot.com/2007/05/raw-rhubarb-rocks.html) for Helen’s interpretation of the raw rhubarb compote at Rendezvous. Good Lord. Nice to see yet another recipe using this lovely & versatile fruit (sorry, vegetable). I recently came across a huge bunch of rhubarb, and despite having baked and cooked with it pretty much every day, I still think I can make another few desserts. One of the things I made was rhubarb & ginger jam, so your rhubarb & ginger tartlets seem really appealing!! C’est magnifique et me donne envie de me mettre à la rhubarbe! Une vraie beauté cette tarte, elle donne vraiment envie. Merci mille fois de continuer à partager les recettes pendant le séjour en France. I don’t think I’ve ever had rhubarb on its own, it’s always been paired with something such as strawberries. 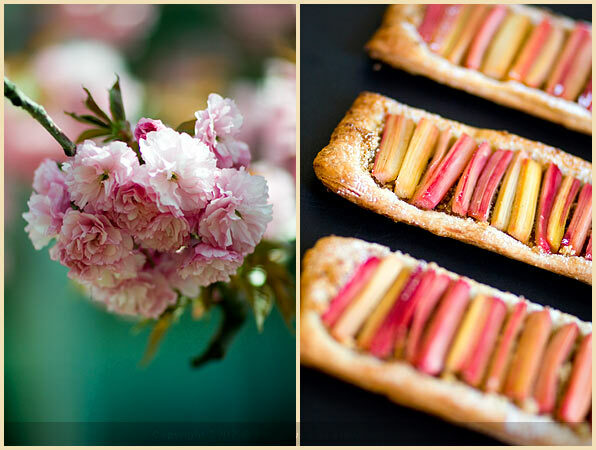 What a beautiful tart–my local market has had bunches so I can’t wait to try this, sounds lovely with the ginger! This title must be written by you! I’m so delighted to discover your recipe and your pictures which seem to me so natural and so tasty! What a wonderful ritual for families! My grandmother always made rhubarb pies. They were my very favorites! When she made them with strawberries they were good but I liked just rhubarb the very best. I would so love to bake one with her today. Gorgeous photo, I *must* give this a go! I think this may be my fav photo to date. And I love rhubarb! Rhubarbe achetée aujourd’hui, tarte demain! Elle fait très envie cette tarte ! Celles-ci plairaient beaucoup a ma maman, qui adore ca. J’aime beaucoup la disposition des tiges, tres classe. Quand je pense que j’en avais un beau pied dans le jardin et qu’il a disparu. Pour ceux qui craignent l’acidité de la rhubarbe, il faut savoir que la rhubarbe rouge est moins acide. J’ai mis des années à aimer la rhubarbe. Ta version est à tomber. D’ailleurs, j’en prends une part au passage. Au fait, as-tu vu que je t’invitais à un questionnaire ? I’m not surprised you could tell whose tart it was from the taste–I could always tell which of my 5 aunts had baked a pie, even though they and my mother all learned how from my grandmother! j’adore votre blog, votre honnêteté et votre capacité à confier au monde de précieux morceaux de votre vie, tout en simplicité. Tout y est agréble: vos merveilleuses photos, vos recettes inspirées mais c’est surtout votre façon d’écrire qui me fascine. 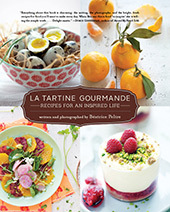 Je rêve du jour où je pourrais collectionner les livres de vos recettes. Comme promis, j’ai fait ta tarte aujourd’hui (une grande) UN DE LI CE!!! La prochaine fois je mettrais peut-être un tout petit peu moins de gingembre râpé. Merci de nous avoir révélé une telle gourmandise ! tes photos me font trop saliver! et puis mariée à ces épices magiques, la rhubarbe doit être sublimée…. Looks wonderful. Your photos are amazing and the rhubarb, ginger and vanilla are a match made in heaven. oh my! This looks so lovely! ….Especially for the warm weather! That looks so perfect! I bought some rhubarb two days ago and was wondering what to do with them. Thanks for sharing the recipe. Tammy, nice, thanks for the tip. Pille, oh yes, I saw your great posts. You are definitely making great things with it. Mary, merci beaucoup. Je ne peux pas resister. Lisa, thank you. You have to try. Rhubarb is such a treat. Tana, oh very nice memory indeed. I have a lot of these too attached to food! Menus propos, ah je suis si contente que tu aies essaye et aime! Merci beaucoup! Claude-Olivier, aahah, oui je crois qu’il faut que tu t;y remettes. C’est si bon! Bergeou, c’est une bonne chose. Gracianne, ah bien dommage qu’il ait disparu, que lui est-il arrive? Jeff, not at all. Very soft. Rosine, merci bien du conseil, je ne le savais pas! Loumi, merci. J’en suis ravie. Lucette, ah this is quite interesting, isn’t it? I also have the same thing about salad dressings…. Julia, merci de votre tres gentil et encourageant message. Cela me touche vraiment. Cest un superbe compliment! Vraiment, encore merci. Sarah, thanks. These two are good friends indeed. Naima, merci de ta visite et bienvenue. Je suis contente que cela te donne envie. Nora, I am glad. I hope you like it if you end up using it! Hi Bea! I love your site. Your pictures are beautiful and the food you make is divine. I tried your rhubarb tart last night and it was delicious. What a brilliant recipe- I’m so glad I found you!! I will be a dedicated reader from now on. Oh que c’est beau ! J’aimais bien présenté également mes petits tronçons de rhubarbe un peu longs comme toi, mais tu ne trouves pas que ce n’est pas très pratique à manger ? I just came upon your site and can’t believe it. It’s insane. You are an unbelievable artist and chef. It’s like I’m looking at a very expensive book – I still can’t figure it out. Et je suis ravie que les recettes soient aussi en français, car ça m’évite d’avoir à traduire les proportions (toujours une prise de tête). J’adore la rhubarbe et j’en ai fait planter dans mon petit jardin à Rome, même si – désormais – elle n’est plus aussi fière que quand j’étais gamine. Merci encore pour ce blog succulent. j’ai essayé ce week-end et c’est délicieux ! l’association rhubarbe et gingembre est superbe et la présentation originale. On trouvait que les parts étaient grandes, mais tout a été englouti rapidement ! Thanks, merci a tous. Josephine, ravie que tu aies aime ! I like the idea of a rhubarb tart and your site. The picts of them sold me. I made Rhubarb Jam for my internet cooking and gardening show, http://www.gardenfork.tv , and it came out pretty good. I will try my hand at the tart. Vivement le printemps! Je voix pas l’heure de faire cette tarte. Mais, hélas, je vais pas renoncer au topping meringué. Très beaux site, by the way! Sounds delicious, but I am unclear about how to use the vanilla bean in the recipe. Do I really add the seeds to the brown sugar, or do I grate the bean into the sugar? Thanks! Beautiful blog! This tart looks amazing and I will try the recipe soon. Je viens d’essayer ta recette de tarte à la rhubarbe gingembrée (un peu arrangée avec les moyens du bord)et c’est un délice. C’est la première fois que je laisse un commentaire mais je te lis très régulièrement et j’adore ton site. Tes recettes sont très alléchantes, tes photos sublimes et poétiques. J’ai mis ma version de ta tarte sur mon site! Have been looking for new ways to use my rhubarb that grows all summer long + remembered seeing these beautiful photos some time ago. 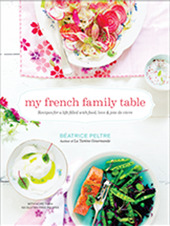 This was wonderful and is now in the ‘rhubarb recipe rotation’ at our house… merci! Hello Bea, thank you for this recipe and the story 🙂 C’est vraiment magnifique!